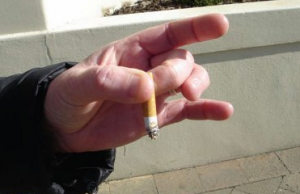 Why is it that smokers (in general) think that sharing their butts with the world is ok? 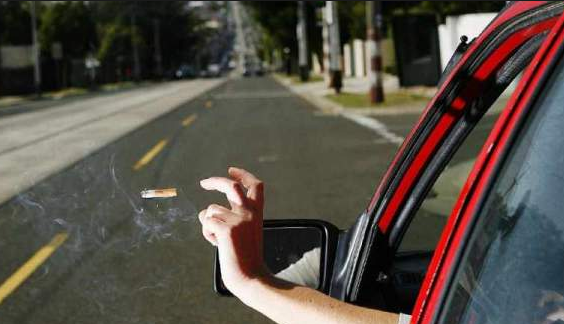 Do they really believe that tossing a freshly completed cancer stick out the car window is not littering? Every time I see someone do this, I feel like driving up next to them and tossing any available garbage through their car window. Can you imagine the shock on their face when I land a shot in their back seat with a half-drunk Big Gulp and a banana peel? I do have a theory about why this habit is so prevalent. People who smoke, for whatever reason, have chosen to completely ignore all the health risks related to this nasty habit. If you can’t tell, I am not worried about offending any readers that might happen to be smokers. You know it, we all know it – smoking is nasty and carries with it an earlier death sentence in life. You have obviously dealt with this issue in some manner and chose to ignore it. My theory is that smokers have learned not to care/respect their own health/body, so therefore they begin to not care about anyone else’s. My same theory extends to the second-hand smoke situation. Hey, I don’t have a pack of my own, so there’s a pretty darn good chance I don’t want to inhale your byproduct. When I am camping I don’t snuggle up to the campfire and inhale deep breaths of smoke for the pure enjoyment of it. I used to be more timid about responding when people asked if I mind if they smoke. Usually, I was tolerant and just distanced myself. I learned this response from a friend. They ask “Mind if I smoke?” I respond, “Mind if I fart?” Crude, but this typically gets the point across. I am really curious as to the rationalization smoker’s who do this have for the littering habit. Do they figure they pay enough taxes on their smokes that it should cover the crews needed to clean up after their droppings? Is this their little way of getting back against the world for coming down on them all the time? Still upset that laws are being passed to limit where they can light up? Do they just care less? Littering in general bugs me, but smokers doing it just goes over the threshold of my tolerance. You have an ashtray in your car, and there are waste receptacles all over every major city. They are there for a purpose. Oh, and while I’m at it, smoking DOES cause cancer and YES, it is a disgusting habit. Sorry, no pulling punches on this one.